Yellow Mellow! 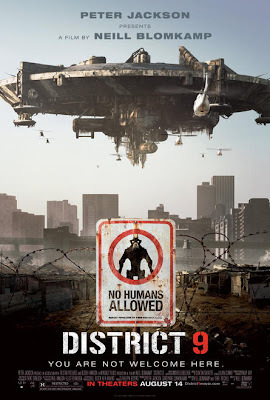 : District 9 Movie Review! District 9 is one of the best & coolest sci-fi movie I have ever seen! The film has everthing! Action, emotion, violence, characters development (including the aliens as well), great location, believable storyline (both touching & frustrating), great score plus everything you ever wanted for a great sci-fi movie and you know what? The film only cost $30 million dollars! The action is just simply great to watch. No unnecessary or repeated shots. Distirict 9 makes Transformers: Revenge of the Fallen looks like it was made by a 9 years old kid. District 9 ROCKS! Totally agreed. With these sort of new faces and great acting, it makes the movie exciting & realistic.